$6 billion Company that Started with a Tweet - Something New Everyday! Here's a tweet Travis Kalanick sent in January 2010. The reply from Ryan Graves happened 3 minutes later. That tweet was worth over a billion dollars. January 2010 was the month Travis was doing a test run with 3 cars in New York for a mobile app that he and his friend, Garrett Camp, had just created. They had decided it was time to start a company around the app and, needing to find a General Manager to run it, Travis took to Craigslist and Twitter looking for the right person. Ryan's reply to Travis came as he was looking for something new. He had some experience at GE, and had worked for Foursquare for a while for free after the company turned him down for a job. He was ready for a new opportunity - and took a chance with this tweet. Travis replied back, they met, they hit it off, and Ryan joined Travis and Garrett on March 1st as their first hire. With their new company started, the three of them then invited all their friends to demo the product and they officially launched in San Francisco just 3 months later on May 31st. This week, the team that started with that tweet has built their company, Uber, into a company that is currently valued at over $60 billion (they just announced another funding round of $2 billion this week http://bit.ly/ubers-next-2-billion). 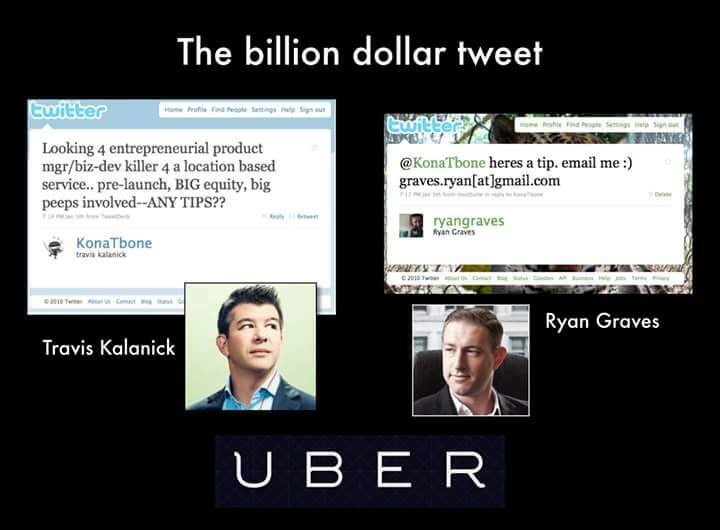 $6 billion, and that tweet from Ryan (who today is Uber's Head of Global Operations) began a journey which has made him a billionaire today as well. How are you using Facebook, Twitter, LinkedIn and Youtube today? As a wall of content? As a broadcasting tool? Or, like Travis and Ryan, as a way to find the resources, connections and opportunities you need when you need them? Depending on how you use it, social media can make you feel apart from everyone, or one step to anyone. It can overwhelm you, or empower you. It can be a time waster, or a time saver. What do you need or who can you help today? It may just be a tweet away. Of course, there is no promise that one connection or one tweet will result in you making a billion dollars or impacting a billion lives. But there is no promise it won't either.